The PRS MT 15 is a commanding two-channel amp with balanced aggression and articulation. Powered by 6L6 tubes, the MT 15 has a large, bold sound, so you can dig in heavy with rhythms but also get singing lead tones out of one amp. Whether recording, practicing, writing, or playing a small room, this amp has everything you need. The MT 15’s design started with heavier players in mind, but in the end, it has a lot to offer players of all genres. Like the PRS Archon amplifier, the MT 15 features five gain stages before the Master for full, lush distortion. The gain channel gets big, chunky tone with massive, tight low end, never losing its articulate note definition or great lead tone. The clean channel is bright and chimey, good with chords and fingerstyle playing – whether with a pick or not. The clean channel also features a push/pull boost control that adds a little overdrive for old school crunch. No matter what tone you dial in, the MT 15 stays balanced across the spectrum with a sweet, smooth tone that won’t bite your head off. Additional features include an effects loop and bias adjusters that are accessible from the back panel for ease of servicing. Despite its 15 watts, the MT 15 sounds more like 50W, so a half-power switch that takes the MT to 7 watts is a welcome edition. Bottom line, the amount of features, the hugeness of the sound, and the raw horsepower of the circuit make the MT 15 an impressive lunchbox hero. 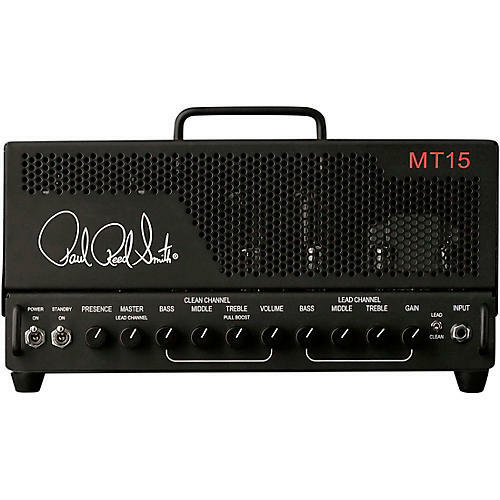 The MT 15 is Mark Tremonti’s first signature amplifier. Dimensions: 14" x 8" x 7.25"